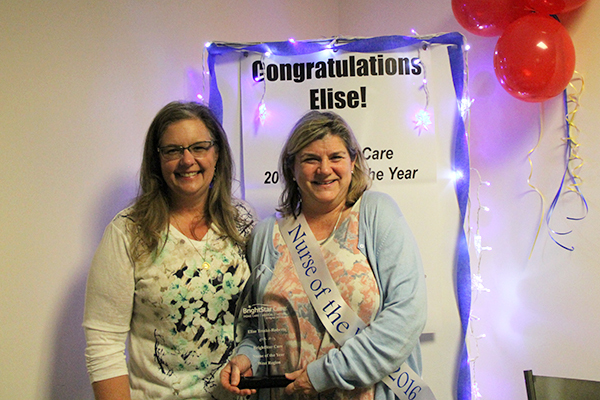 Last week, BrightStar Care of Bellevue/Eastside hosted a special celebration to share the great news that not only was Elise Troske-Roberts nominated, but that she is a national finalist for the 2016 Nurse of the Year award. “Elise Troske-Roberts, RN is an amazing woman—and I don’t use that term lightly,” said local BrightStar Care Owner Kathy Lyons. “Not only do her 20+ years of experience include ER Triage, ICU, infusions, L&I case review, and home health case management, but she is the mother of five (yes -5-) children still at home, an avid community theater actor currently staging Romeo & Juliet, and is working on completing her course work to become an ARNP. As a national finalist, Elise along with the three other finalists will be recognized at BrightStar Care’s Branch Leadership Conference in Chicago, IL on Saturday, April 16 at an Award Gala and the 2016 National Nurse of the Year winner will be announced. Be sure to check out Elise's full nomination to learn more about the great work she is doing. Best of luck, Elise, and congratulations on this wonderful accomplishment!